GeoDLL is a Geodetic Development Kit or a Geodetic Function Library for worldwide 2D and 3D Coordinate Transformations and Datum Shifts with highest accuracy and for calculating Meridian Convergence and many Extra Parameters. Furthermore: Helmert and Molodensky Parameters, NTv2, HARN, INSPIRE, EPSG, Digital Elevation Model (DEM), distance and Time Zone calculations and much more. 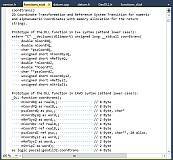 GeoDLL is available as 32Bit and 64Bit DLL and as C++ source code. New tools for processing NTv2 files. Updated time zone and daylight saving time data. Insertion of Polygonal Validity Scopes into a NTV2 binary file. The Geodetic Development Kit GeoDLL is an easy to use function library which is designed particular for GIS professionals and software developers. GeoDLL allows developers to embed thousands of preadjusted, precise coordinate transformations and geodetic datum shifts and custom best fit transformation parameters into their individual geoinformatics software. GeoDLL supports datum shifts with Seven Helmert Parameters and Three Molodensky Parameters and with NTv2 and HARN grid shifts. GeoDLL contains many geomatics tools for GIS development, such as creating Helmert and Molodensky parameters, tools for analyzing and manipulating NTv2 files, INSPIRE and EPSG support, digital elevation models and distance and time zone calculations. GeoDLL has grown with many improvements over the years and it continuously benefits from user feedback. Thanks to the numerous improvement suggestions of the users the quality and the functionality of the Geodetic Development Kit increase constantly. Additional function group "NTv2 Transformations"
Function group "Time Zone Calculations"
The geodetic functions of the GeoDLL are encapsulated for specific tasks in function groups, which can be separately licensed and purchased. GeoDLL supports the development of geodetic software on various platforms by providing geodetic functions. The operating system WINDOWS provides software developers the opportunity to use prepared functions of third-parties in their own software applications. Thus, geodetic functions of GeoDLL can be linked to programs written in C, C++, C#, Java, Pascal, Delphi, MS-Access, Visual Basic, Visual Objects or which are written in other programming languages. To support the GeoDLL, examples and interfaces with source code for many commonly used programming languages are provided. GeoDLL comes with extensive documentation and is supplied as DLL file for 32bit and 64bit architectures or as C / C++ source code. 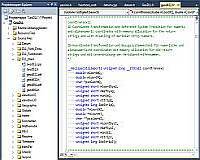 GeoDLL works with most programming languages and it can be used with Microsoft Office programs. 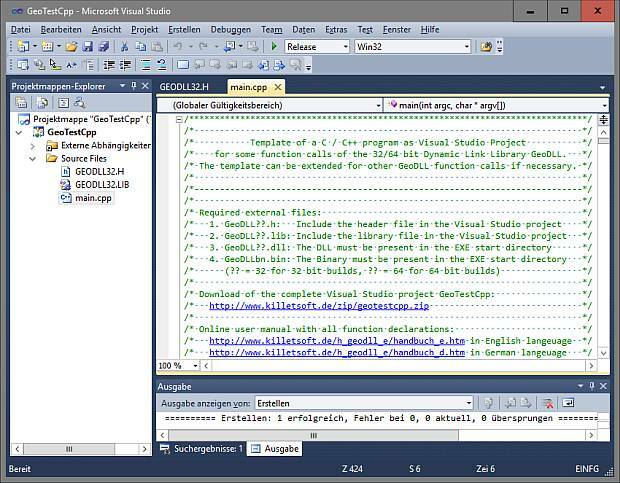 GeoDLL is written in C / C ++ and is developed using Microsoft Visual Studio. Thus very fast performance, compact code and high stability are assured. The functions of GeoDLL are prepared for multithreading. The geodetic functions of the GeoDLL are encapsulated for specific tasks in function groups, which can be separately licensed and purchased. At the top of this site all function groups are listed as further links. You can view the detailed descriptions of all GeoDLL functions in the Online User Manual. Detailed description of all geodetic functions in an English and German language MS-help documentation and a runnable test version of GeoDLL are contained in the download file. The characteristics of the various functional groups and the contained functions are listed under further links at the top of this site. The operating system WINDOWS provides software developers the opportunity to use prepared functions of third-parties in their own software applications. 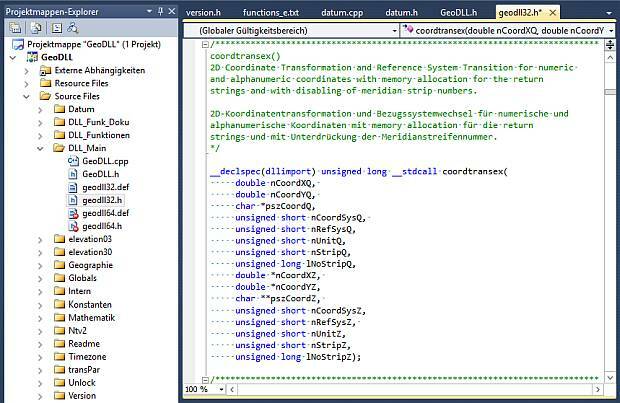 Thus, geodetic functions of GeoDLL can be linked to programs written in C, C++, C#, Java, Delphi, MS-Access, Visual Basic, Visual Objects or which are written in other programming languages. To support the GeoDLL, examples and interfaces with source code for many commonly used programming languages are provided. An example of using GeoDLL is the program TRANSDATpro that is available for download on the internet. GeoDLL is delivered for WINDOWS operating systems with 32bit and 64bit architecture. Therefore, the DLL can be used with win32 applications on 32bit and 64bit WINDOWS operating systems and with x64 applications on 64bit WINDOWS operating systems. Frequently we got inquiries whether the geodetic functions are also available for other operating systems like LINUX or UNIX. Also some developers would not like to build functionality without knowledge of the source code into their programs. For this reasons we decided to offer the geodetic functions as source code. 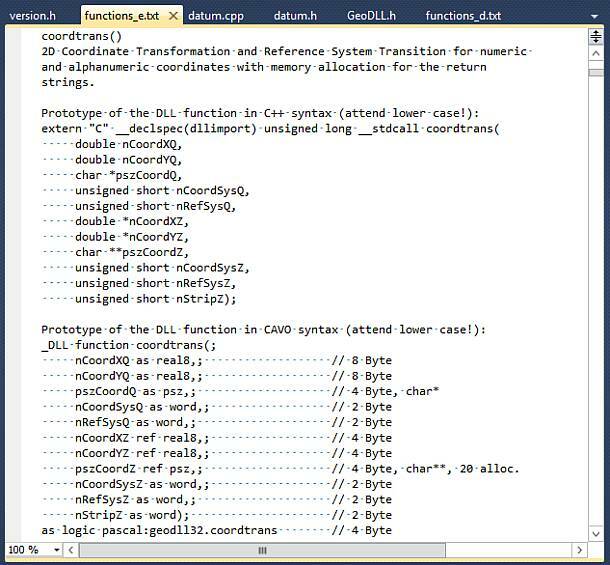 The functions contained in GeoDLL can be acquired completely as C++ source code. The source is extensively written in ANSI-C++, so that the migration to arbitrary operating systems and hardware platforms is possible with minor modifications. All the Coordinate and Reference Systems, supported by GeoDLL, sorted on continents and countries with additional information are put together on a separate internet page. GeoDLL supports the Digital Elevation Models CGIAR and GLOBE (3 and 30 second rasters) for the point-exact determination of ground elevations over the Mean Sea level. Detailed information about the use of the Digital Elevation Models are arranged on a separate internet page. GeoDLL uses Coordinate Transformation formulas based upon EPSG specifications and publications by Schatz, Schuhr and Klotz and Hooijberg. Algorithms used for country-specific transformations are either published or made directly available by the Measurement Authorities of the respective countries or by similar respectable institutions. To achieve the highest precision only strong formula algorithms are used for calculations. Coordinate Transformations without changing the geodetic Reference System have extremely high precision ranging within millimeters. 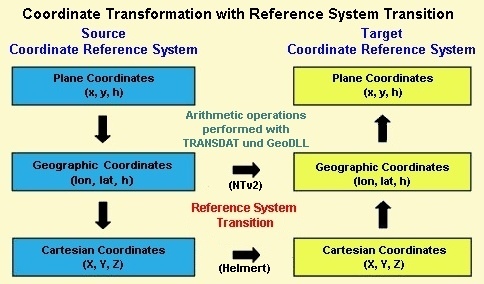 A good example of geographic coordinates transformations between Gauß-Kruger and UTM Coordinate Systems made with GeoDLL are the results published by the North-Rhine Westphalia Land Survey Commission. It was confirmed that the differences were within the lower millimeter range. 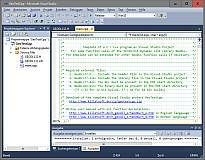 GeoDLL is written in the programming language C++ and developed on Microsoft Visual Studio 2010. Thus very fast performance, compact code and high running stability are assured. The functions of GeoDLL are multithreading ready and so it supports Multi Core processors. GeoDLL already contains some ready to use interfaces and definition files for integration of geodetic functions into the programming language of your choice. Also some example sources in different programming languages are present. The source codes listed here are provided in the download file. GeoDLL is available for download from this site as a test version (shareware). All DLL functions can be used without restrictions for a limited period of time. That is enough for testing and determining whether the GeoDLL functions run with your application. You can lift time limitations by entering the unlock codes you can obtain from KilletSoft GbR for each of the above listed function groups. The unlock codes are passed to the DLL-function setunlockcode(<unlock key>,<user ID>) from your application. Then all subsequent calls to the functions of the unlocked group will have no more time limitations. Single license: A Single function group license entitles the license holder to use the functions of a Geodetic Function Group with a single software application developed by the license holder. Applications developed by the license holder using the geodetic functions of a group, can be distributed to any number of customers or can be installed as a single application on the Internet server of the license holder, or the server of the license holder's Internet service provider. General license: A General function group license entitles the license holder to use the functions or a Geodetic Function Group with any number of applications developed by the license holder. Applications developed by the license holder using the geodetic functions of a group can be distributed to any number of customers and can be installed on multiple Internet servers of the license holder or the license holder's Internet service provider. Internal license: An Internal License entitles the licensee to use the functions or a Geodetic Function Group with any number of applications developed by the licensee. Applications developed by the licensee using the geodetic functions of a group may not be distributed to customers and may not be installed on an Internet server. Applications created with this license must be in context with tasks of research and education. Available selective licensing of several function groups guaranties that you only pay for those functions that you intend to use. Pricing and ordering information can be found in the Price list. Order the for GeoDLL function groups with the electronic Order Form. The test version of the Dynamic Link Library GeoDLL with a detailed description and with information about the use of the functions can be downloaded as ZIP packed file by the Internet. For unpacking the download file you need an unzip program, which you can download from this side.